Muhahaha! It's late in the morning and I'm STILL the first to wish everyone a Happy March! Hey! Stan's Part Two of his column is up! Take a peek! I'm off to Portland to see my Dad and get some work done around the valley. Off I go! JustCallMeDave has the reins on ifish for a couple days. Be nice to him! Charlie, a friend of mine in Unalaska sent me this picture. 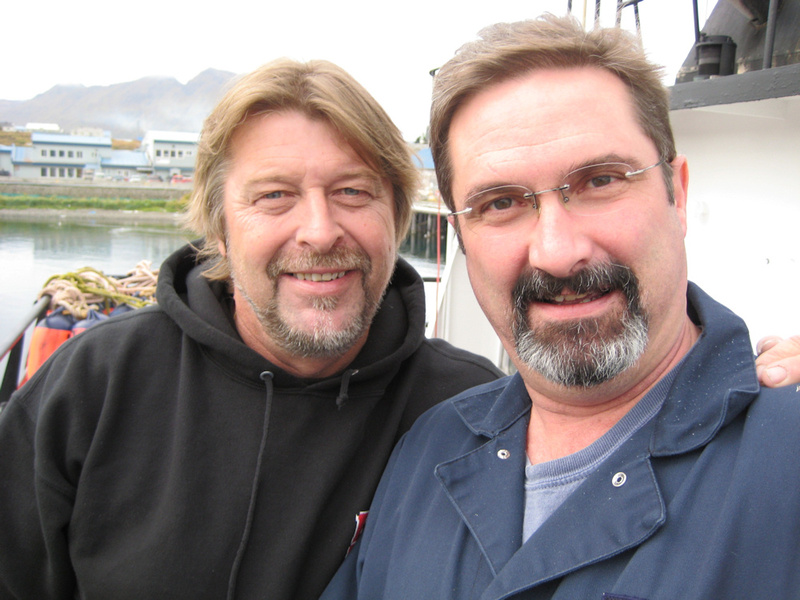 I went to high school with Charlie, and now he's the Fishing Vessel Safety Coordinator in Anchorage and Unalaska. It's old news, yeah, but it was still nice to see such a neat picture. So many people admired Phil. The Salty Dogs had a topic, here: RIP Captain Phil. Sigh. What's on my mind, today? Well, I can't believe what the moderators put up with and how badly they are treated, sometimes, by upset members. I wonder sometimes if these members realize that these are volunteers who love ifish, and want to keep it nice for all users. I suppose it's a bit like being a police officer, sometimes, in the way that everyone loves them until they break the law, and have to deal with the consequences. Then, they are all "pigs". So frustrating! Some of the things people say to them, and yet they hang tough. I have had a couple moderators quit, but very few. It takes a special breed to take the angry and sometimes drunken written words from some, and just let it roll off. I have so much admiration for the moderators at ifish. I wasn't one who could take this, at first. The mods have taught me to withstand it all, (mostly!) and ignore a bunch of things. The fact is, there is just no way that you can have a crowd of thousands, and please everyone. So, we have to be able to let some go, and either find a web site that more closely matches their values, or let them go and find out that ifish.net is a good place, after all. I spoke to the owner of a fishing web site at the Sportsmen Show, and it was so funny. He had been a member of ifish, and he was one who was told that "if you don't like the way we run ifish, go start your own!" And... he did! I told him that when he did, he would understand more clearly what we go through... and indeed! He does, now! He told me so! This is not to say that he now does or does not agree with how we run ifish. Just that he very clearly understands now, what we deal with in making and upholding our Rules of Use or AUP: Acceptable Use Policy. I have learned more, I have toughened up more, than I might have wished for. Seriously. I liked the old me. I was a softy and I liked it that way. But, obviously, God had different plans for me. I had lessons to learn. Now, if I can only incorporate the "stay sweet" that I like, and the toughness to not let people hurt me, I would be pretty balanced! I do have trouble with that balance, though! This, is what I'd like ifish to be. I wanted a piece of heaven on the internet! What's wrong with that? And so, with that thought, I'm going out to the river, where things are true, honest, just, pure, lovely, and I'm going to give praise for all those things, and pray to God for peace on ifish! I can't wait to see everyone! I have Salty Dog hats, a few decals left, and some sweatshirts in Xl and XXL. My son said to me, "Seems like you are never around, anymore!" And I miss being home! But, I'll be home later tonight! And then, if I look at my schedule, all I am doing is sitting on the floor, filling out Kwikfish and Maglip orders! The Salty Dogs remain a wonderful group of people. I had so much fun meeting and talking to people, yesterday. I think that the Saltwater Sportsmen's Convention is going to be big, someday. It was BIG yesterday, but I mean REALLY big! We have a good start! What an incredibly wonderful group of folks, though! When people go there, they could pick up two tickets to go to a seminar on how to release wild fish. It was partially from a grant from ODFW through OCEAN. If you listened to the seminar, you walked out with a great tool to help you dehook wild fish! I have to wonder how many wild fish will be saved due to this information and the tools given out? Awesome! So awesome! I met the nicest folks! I got to work with Teri, who made the sweatshirts, T shirts and hats for this event for the Salty Dogs. They are beautiful and are offered at a great savings. It's still open, today, if you want to trek to Newport! It's SO worth it! I met this gal yesterday at the show. The one who made the Salty Dog apparel. I just really liked her! I mean, immediately. Ever have that happen? It happens quite a bit to me, but this time it was eerie! It was like the minute I sat down, I knew I had met a new friend. And then... it was just so odd! It seemed nearly verything, we had in common! I think that the capper was when I was sitting in her car with her, and I said, "What kind of car is this? She said, "A Ford Escape." I just broke out laughing. "Oh! I have one of those, too!" I mean... we had everything in common! Bizarro! I just spoke to Tiki Charters, "Oly". I really like him! What a great guy! We were laughing about life's difficulties and how God has a plan for all of us, if only we'd just let go and let it happen. How we always want to grab it back, and worry about it ourselves. Why is it that we do that? Just let go, and let God! So easy! I am just so blessed in my life to have so many good friends. I had to giggle last night when I got an e mail threat from some fool-chicken who was hiding behind one of those fake e mail accounts. Yoo hooo? Out there? If you aren't big enough of a man to talk to me to my face, (Big bad Jennie scares you?) I'm not going to take you seriously. Alright? I mean, come on! You want me to be scared of someone who hides behind a bush and throws snow balls? Kicking people off your site is not nice. I strongly suggest you reconsider. And quickly. I get this from time to time and it just makes me giggle how tiny some people are. And most of them are men, it turns out! All I can say is that we have thousands of members who don't even get mentioned on the mod board, let alone get kicked out of it. It takes quite a bit to get kicked off of ifish! Reconsider? I don't think so! Not with that kind of sucker punch! I've let go and let God handle it. Here I was all prepped for Spring and now I'm wearing my winter wear, again! I hope my pear trees don't lose their blossoms and chance of fruit, this year, again! I have one lone hummingbird, sustaining the cold. He's got two feeders, front and back of the house, all to himself! Brrr! Back with the Uggs on my feet! You know, I haven't been able to fish at all this year. Well, no. I've fished about as much as a normal person might. But, not like the fanatic fisher I've always been. I can't believe it. It's just not right. I love to fish! How come I'm not fishing? You know, DAILY like I used to? Well, because it seems ifish has grown by leaps and bounds, and keeps doing so! When oh when will it slow down? How many people in this area are into fishing? Seems quite a darn few! Or-- quite a darn million? Long ago, during the height of my fishing mania, I sat down one day and thought it would be neato to start a fishing log on the internet. People came! People continue to visit and talk and man oh man alive! We have ifish.net! Oh, boy, do we! My Mom used to use the term "Busman's Holiday" for what I might be feeling, or actually... what I fear feeling! Am I losing the love for fishing due to what I do, every day on the internet? I hope not! It's my greatest fear to lose my love, or better put, "TIME" for my love of fishing! Sometimes, I just wonder if we should go with it? Is it that we are losing our love for fishing, or simply enjoying other things? Like gardening, birding, etc? Is it a bad thing, not to fish as much? Yes! It just is! It's OK for us to feel sadness about this. Sadness, and a yearning to again, have time for our love of what we love, again! Funny! But I miss that anticipation of not being able to sleep the night before fishing because I was so excited about it! I used to wake, repeatedly, "Is it time to go yet?" I keep putting it off. Right now, I'm living on the hope that by the time the springer season returns, I'll have time to fish and love it, again! I'm still counting on that! Counting on the fact that I'll not sleep nights, because I'm so excited! I felt it the other day, actually and it gave me hope for hope! Bill had the big boat out, and was cleaning it up in preparation for our trial run. I saw it in the driveway and my heart skipped a beat! 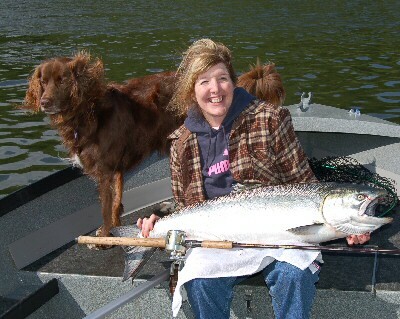 All of the sudden, in my mind's eye, I saw that beautiful big springer I caught one year, zipping across the top water and tugging at my entire being! I thought it would pull me in! Visions popped into my mind of sitting on the jet pump seat, hand to my heart, feeling it beat, beat, beat... half being afraid it would kill me, but half not caring if it did! A big springer, still flopping on the floor of the boat! "Did I do it, Bill?" Did I really do it?" Did I do what the doctors said not to do? Did I land that big, beautiful springer... all by myself!?!?! Oh, yes! I'm feeling it! It's still there! There is no reason to fear! It's just that right now, I have other things to occupy me for a while, maybe longer... if I do! But, my heart... my love lies in the water, and it's patiently waiting for me. It's the shining, flashing sides of a beautiful spring chinook, scales flying through the air like glitter in the sunlight when it's pulled over the side of the boat. There is nothing... NOTHING like a spring chinook, fresh from the ocean! My time for my love for fishing will return like the tide. It has to! Nothing makes my heart pound like when that rod jerks out of my hand and nearly pulls me overboard when a slack bite hits. Dang. I want to go right now! I let my line out, as soon as we leave the dock! There are fish to be had, right there! But, instead, ifish pulls at me, and its work calls me. My Dad needs me to visit. My doctor needs me to visit! All of these things, so that when the time comes, I will hear Bill's engine rev in the driveway, the boat hooked up and impatiently waiting for me to join him. It is these joyous things in life that we need to do, to be able to sustain our otherwise more difficult and sometimes unpleasant tasks. If I didn't have such intense and challenging things in my life, I would likewise not receive the incredible amount of joy that I do, out of fishing. I've never been much for boring. My joy equals my sorrow and my frustration equals my excitement! Today I will work. Tomorrow, I will play! Kilchis is an addict. Thanks To Papahog on ifish, he is now a beggar every morning. He devours these little "Jerkybites" from Waggin' Train. Dang, they are expensive! I can only find them at Freddies and when I'm out, he lays there with his head down, and won't get up. What a bunch of spoiled beggars! And for Rev? It's pig ears. Gotta have 'em! Each morning the dogs race down the stairs, go out to do their business, and rush in to get their treats. Rev can hardly wait. She's a forever puppy and sometimes forgets her business, and goes direct from one door to the other, just to get her pig ear. Molly? She's a control freak! If she wasn't so darling, I would have none of it. Every time I come near her in the kitchen, she makes this pitiful little sound and twirls around on her tip toes until I follow her to her eating place in the laundry room. She wants those little delectables packed in tiny little zip pouches. Party Mix. Oh berother! She sometimes actually eats it, but mostly she just begs. I can just hear her, after I follow her to her dish. "Look what I made the people do!" And- she won't eat the regular canned cat food. Oh, no! That's not good enough for her. It's got to be "Filet mignon with garden greens." Huh? Every time I shop for her treats, (which is way too often) I'm embarrassed to go to the area for spoiled cats. There are only a few of us there, and we are all embarrassed, it seems. Me? All I wanted was a simple lemon cake for Bill's Birthday. Just like Safeway made when they opened up. Oh, they were grand! Standing four layers high, and sprinkled on the outside with dried coconut! I really wanted to buy one this year for Bill and surprise him... because they are so delectable! But, no! They don't make them anymore! So, I can trek all the way to Costco and successfully pick up chicken jerky strips and pigs ears, go to Freddies and get Kilchis' Jerky Bites... but when I call Safeway to order the people food we desire, it's not available! I make a killer spice cake, and that is actually one of Bill's favorites, so I'll do that, but come on! Why would you quit making that lemon cake, Safeway? It's so, so good! I'm begging! I'm twirling around in circles and trying to have power over them, but they refuse to listen! We want lemon cake, people! Maybe I should check the pet aisle? Or-- maybe I'll just forget it all and go out to the river to fish. The river is in wonderful shape and Bill has to go out to catch his Birthday fish, today! Time to get out there, again. I'm late! I'm late! Just after Bill caught his, I caught one! We got the easy fish! Dang, dinner was good last night! And I came up with a creation! I had some fresh Oregon chicken. Cut it up into pieces and rolled those in a thinned out bbq sauce. 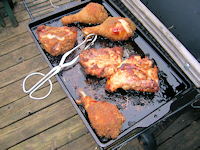 You know, it's difficult to bbq chicken with sauce on it, because it burns. But, I watered it down to lessen the sugar content, and for the particular method I was using. Then, I shook it in (you heard it right!) Shake and Bake! Anyhow, it was delish! Try it! You'll like it! The water is beautiful, today! It's sure getting low fast, though. The Wilson should be good. I need to take Andrew to the doc, today, to check out his leaky aortic valve. We get to see Dr. Menashe, our favorite! Say a prayer for Roo! It's hard to be worried about my own aorta, and then find out that Andrew's is the one with the problem. Not fun for Mom. If we have time, we'll stop by to say hi to my Dad, before trekking homeward for an appointment with Andrew's Voc Rehab guy. Have a great day, and think sunny thoughts! Oh! I got a digital picture frame for Bill, for his Birthday. (That, and one of those giant ladders, so he's safe.) And he loves the frame! He is able to take the pictures out of the outdoor cam and view them on his digital frame. I also filled it with pictures of he and his friends fishing, and all of his animals, past and present. He adores it! I added music that he likes, and he's set! Never seen him like electronics, much, but this is a winner! 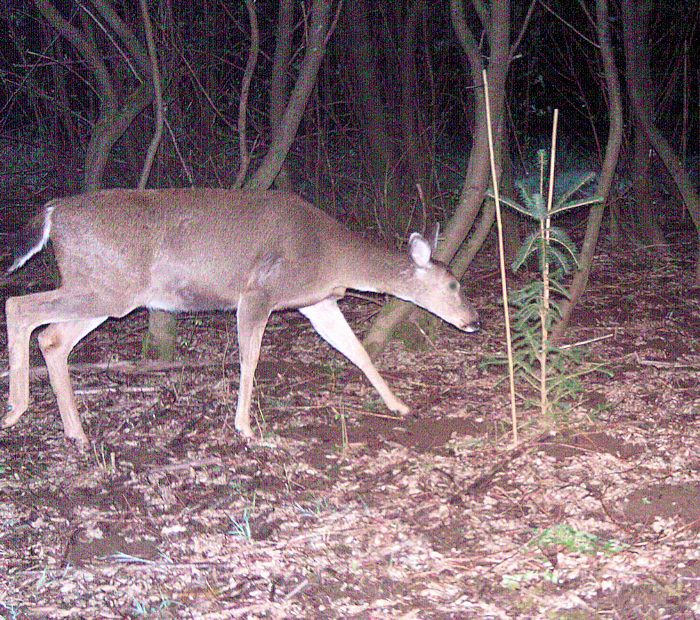 This is a deer caught on our Stealth Cam last night! Silly me. As if... I thought I'd try to down the weeds in the garden in an effort to get Bill to stop with the chemical weed sprays. I bought landscaping material and unrolled it onto the garden, got splinters in my hands from it, and now it's all blown around in a twisty mess! So far, like I said, my garden is chemical free. "But, Bill? Why have a garden at home, if you are going to fill it with chemicals? Why not just buy stuff?" Argh. He didn't "buy" it, again. But, you guys! Chemical or no, Spring is here! Isn't it awesome? I took time out after a meeting yesterday to lay in the sun and do some reading. I couldn't keep my mind off of how gorgeous it was! How wonderful the sunshine felt! How green things are becoming! I am in love with the sunshine! It's my Prozac! - and I mean that most sincerely! Nothing does me good like sunshine does! Sunshine and a hot cup of coffee. It seems to thaw the winter out of me and that takes a while! I had to sit for a long, long time to unthaw. I mean, how long does it take for winter to set in to a person? It takes equally long to unthaw! As I sat, I squinted in the sunshine to read my tiny iphone screen and wrote a bit. God bless this land on this Heavenly Day! Where the green grass is growing and the chickens, they lay! The scent from the ocean, off Tillamook Bay. It's quiet, yet! The wild birds are still South. The Spring Chinook, still off the mighty ocean mouth. of long days at the shore! Barefoot and laughing forever more! Bill spied a Grosbeak a bit earlier in the week! I say that as a hummingbird sips sugar with it's beak! All around us! Miracles, galore! What gifts we've been blessed with! We rise out of slumber, grab coffee, out the door! Still the steelhead are biting! Would you like to drift along? I live on the river and spring is on its way! Winter tries to hang on, but the sun's out, today! Would you like to come out to play? Tee hee. I love rhymes! I was sitting here thinking, "Ah, bummer. It's raining, again!" And... then I thought! "Oh! It's raining! The rivers will rise and I can fish!" There is good in everything! I love that, about life! No wonder the Bible says, "This is the day that the Lord hath made! Let us be glad and rejoice in it!" you know... no matter what! No matter the rain! I bought a lottery ticket the other day. If I win, I'm going to take care of my Dad in his elder years and give him everything he wants! :) I'm going to win, too! Funny that I've never been tempted to buy a lottery ticket before this. But-- I'd never dreamt of anything that I really, really wanted like this before, either! Isn't it everyone's fear to not be taken care of, some day? I've always had a fear of losing my vision and ending up in some creepy place, where no one knows or cares for me, personally. Scary! But, for today, I can walk on the river, and have a warm, happy home to live in. I can cook while the rain pours, safely inside, and I have a hot shower I can step into... I am so lucky! Mostly, I have a family that I love, living with me! Yesterday I got to sit and visit with a highschool girlfriend of mine. It was so nice! I miss you, Claudia! That was fun! Oh! This morning I woke up and I had my window barely open. There, outside, I heard it! Was it?! Yes! It is! Spring birds! Not a whole bunch of them, but a few! The quiet, eerie winter void of winter was broken! Soon, the air will be filled with birds from every treetop! I can't wait! It was just so good to lay there under my comfy, warm covers and listen! I heard a television weather report that we shouldn't get used to those warm temperatures like we've had in the past couple days. That those are unusual for this time of year. Why would someone need to spoil the fun like that? Hey! Let me bask in that sunshine and enjoy it! Don't be ruining my dreams of more days of warmth and sunshine! Let us pretend, alright? Rain isn't so bad, really, but I do love sunshine! OK, off to a hot shower, and fresh, clean clothes! The things that we take for granted in life are so many. Appreciate them! Notice them! Give thanks! We are so lucky! Even the hot water that runs from our faucets! Magic! Official Ifish "Appreciate your Moderator"Monday! My children were taught when they were young to respect the men and women in blue. Our officers put their lives on the line every day! I taught my kids that they are the ones that put themselves at risk to ensure that our family can be safe. The police put their lives on the line and are willing to shed their blood—if they have to—to keep our communities at peace and our neighbors protected. And with all of this, respect doesn’t even come with the job! But, somewhere along the line... you know, after they got a speeding ticket, or got to talking with their friends who weren't raised with similar values and well, I heard them laughing about the police, or saying negative things about them. "Pigs on ponies, Pigs on peddles..." Sigh. Dang! But you know, as a young adult, I, too went through that period, challenging what I had been raised to believe. My parents, too, taught me to respect the men in blue. Just like religion, I think, or any other ideal that children are raised with. I believe kids naturally challenge our teachings as they come into their own beliefs, and (pray to God!) will eventually come back to what their parents taught them. At the ripe old age of 50, though, I thought myself immune from any negative thoughts about the police. Not so! I earned my drivers license in 1976, when I was sixteen years of age. I didn't get a ticket until this year. I was so proud of never having a ticket! I was shocked, when I found myself holding one. I cried! No fair! I was in Palm Springs helping my Dad, and driving his car when I was pulled over. Those bright shining lights were behind me. Scary! My Dad had been in and out of hospitals for months, dealing with health challenges, and hadn't had time to put his latest copy of proof of insurance in the car. So, when the kind officer asked me for it, guess who got a ticket? ME! I tried explaining the circumstance, but he was dead firm on giving me a ticket. I swallowed hard, (no... I cried!) and drove back to Dad's home to search for the proof of insurance papers. Sure enough, there they were, but it was too late! I wanted so badly to badmouth that police officer! How unfair! I had the proof... just not in the car! (You know, like the law states! You know, it's to protect me from folks uninsured! You know... so that I don't get in a wreck with someone who can't hold up to their end of the deal!) LOL. The men and women in blue, protecting ME by upholding the law that protects US. "Oh!" They'll cry! "The mods are great people and do such awesome work!" ...as long as they are getting the bad guy and not them! But, when it comes their personal turn to be asked to follow the rules and have to take the consequences of goofing up... Well, all of the sudden the moderators are rotten, unfair, and probably lousy democrats or worse yet, rotten republicans! Or maybe both at the same time!! Sometimes, when we close a thread it is because we are tree hugging hippies! At the same time, a moderator didn't let them finish their rant, so we are rotten right thinking republicans! That, from two separate people, affected by the same thread! So, which is it? Are the moderators left or right? Frankly, I try very hard to make the moderating team half and half, so we are balanced. But really, it shouldn't matter, because we don't do politics on ifish. If there are politics, you need to use the alert button, and let us know. Our job on the moderating board is to uphold our rules of use, which are specifically designed to be non partisan. We have a private moderating board where we talk about how to deal with problems that come up. Our policy on that board is to avoid discussion of politics at all. On our public boards, we do allow some fishing/hunting threads that have a political slant, as long as no partisan name calling occurs. We have to, because there are laws that come up that affect the very sport that we depend on for our enjoyment. In my humble opinion, they do an awesome job! But, sure enough, and understandably so, when members start feeling at home on ifish, they occasionally slip up, sometimes! I do, too! I have actually been moderated by my own moderators! And when we do, we may be "busted" by the ifish cops! I know how it feels, too! I've been busted! It's not a good thing! I had to realize that we have to be consistent in our moderating. That means that I have to follow the rules, too. It's just the way that it is! I'll never ever forget a movie I saw years ago, when a family was sitting at the dinner table, and the whole family began to point out the Father's mistakes in life. What a surprise when the Father wasn't immediately defensive and lash out! Instead, he lowered his head in thought, and looked up to say, "I do that. Yes, I do. I will work on that." I loved that! The family was obviously equally stunned as I, the viewer. Oh, I want to be like that! I loved that example, and I have tried, often failed, but I have tried to remember the lesson I learned in that movie, and act, accordingly. Oh, how I wish I would have said to that officer. "Yes, officer. I am guilty. I don't have my proof of insurance." Somehow, though, I have always had this immediate reaction to any kind of person in authority, that makes tears come! And then, defense! Even in high school, when the Principal of the school stopped me in the hall to simply ask how my family was! It's just automatic in me. Tears! Moderating on ifish is not for everyone. I am so thankful for the strength that our moderators show, in not being too affected by the way they are treated, at times. Some of the things folks say is so cruel! I can say for sure that the only reason that I have moderators at all, is because they love ifish and want it to stay civil and want for ifish, only the best! And just like the police, I would like you to know that the moderators even if not literally, are willing to "shed their blood—if they have to—to keep our communities at peace and our neighbors and forums protected." Also like the police, respect doesn’t always come with the job! I am declaring today, March 22nd, the Official Ifish "Appreciate your Moderator" day! Thank you, to each and every one of you, who volunteer your time to keep ifish a peaceful and safe community for all! "Yes. I do that! I do! I will work on that!" Oh, what wonderful words those are! Dang I'm tired! Just got back from Canby, again. It's so nice to see my Dad, but so tiring making that drive! I took Kilchis with me, this time and we stayed at my brother and Dad's house. My brother and I had a great time. He made me this delicious fruit salad for dinner and we lounged. We even had a sort of "church" service this morning, with coffee! Fun! It helped my day go well. We talked about getting through each day, and that it's quite enough, thank you. One day is all that God had planned for us to endure at a time. I mean, think about the Lord's prayer. It says "Give us this day our daily bread." He didn't say "Give us this week" or "Give us this year". Just one day. Give us this one day, our daily bread. That means He will give us everything we need to get through this one day! Just like in "AA" they teach you to stay in the moment, to live just one day at a time! It's such a wonderfully simple way to live! But, we all try to worry about tomorrow, and regret yesterdays. Don't fall for it! Just live for today! Simple! (Yeah, right!) But, it does help to remember that. Try it! So, I came home and my inbox was full, my private messages, overflowing and the moderator board, well, believe it or not, was not needing much attention- thanks to our beloved moderators! But, dinner needs to be made, and the postal mail read. See? It is quite enough for one of us to try and make it through just one day! Unfortunately, I got it backwards when I learned "Don't put off tomorrow, what could be done, today!" Yes. I'm guilty of that! It's blowing hard, here, and really rainy! Such contrast to the lovely weather we've been enjoying. It was 71 yesterday! Poo to the weatherman who said we shouldn't get used to that awesome sunshine! I say "Bring it on! Get used to it!" Kilchis is so glad to be home. I'm afraid he's not much for traveling. He gets so hyper that he won't settle down. Once I told him we were going home, he cuddled up in the back seat and slept, all the way! I felt like it, too. Sure wish Kilchis could drive, and let me snooze! Well, off I go. Have a great day! Make some beef and barley soup. Oh, that sounds good! I wish I had time! Oh! I made a big batch of chicken and dumplings. My Dad's favorite! I froze it in dinner portions and delivered it to my Dad. He was ecstatic about that! Simple pleasures! Speaking of simple pleasures, the other night I bit into the most amazing spring chinook! And I didn't even catch one yet! Oh... it was soooooooooo delicious! It was so oily, I had it dripping from my chin! I want more! Guess I'll have to get out there and catch one! Read it! It pertains to all fishing people! It's my Dad's Birthday, today! Happy Birthday, Dadeo! :) He is 85, today! It's so cold, out! What happened to Spring? That was such a nice reprieve for a while, there! I even got out my chaise lounge chair! I miss it! I was driving home from Portland yesterday and it was snowing! Sheesh! I have to go back to Portland, today, too! Man, I've been busy! We had a wild windy storm a couple days ago, and now I see in the forecast that we have another one approaching us for Thursday/Friday. Come on, sunshine! You can make it through this! Then you'll be home and in the clear, so to speak! I'm working on putting up Stan Fagerstrom's new column this morning, and then I'm off to see my Dad for his Birthday. The river is blown out and I have no shrimp. Sounds like a new country western song! I wonder what would happen if we play it backwards! ?